UPDATE #2: Muni re-updated their website to state if you pay the Clipper fare for $12, you get a return trip on the special express buses AND a 90 minute transfer. This update is a little too late as the B2B is already over. "$8 fares for pass holders must be paid with Clipper cards and will receive two express trips, one to and one from the race"
If you plan to ride the express buses or take the metro, expect to pay $12 adult fare for the privilege. 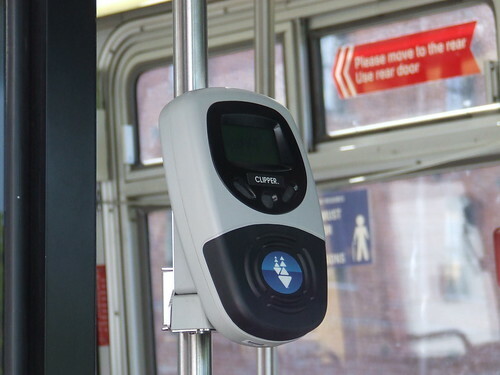 Muni will accept both cash fares in the fare box and Clipper. If you pay in cash, you get a transfer valid until 5PM. If you pay with Clipper, you only get a 90 minute transfer. If you plan to ride Muni expresses to the start line and get home at the end of the race, PAY IN CASH. With the extended paper transfer, you can ride Muni round-trip and it's only $6 a ride. If you use Clipper, you'll pay $24 for that round-trip. If you have a Muni pass on your Clipper card, you pay $8 for a ride with 90 minute transfer, but you still pay MORE than the $12 cash fare because of the 90 minute transfer ($16 e-cash w/Clipper & Muni pass vs. just $12 in cash). While I am criticizing Muni for their poor job of not fixing the Clipper card issue to allow passengers to pay $12 or $8 AND include an e-transfer valid until 5PM, it's also very unfair to those who have a Muni pass on their Clipper card and will still pay an extra $4 to complete a round-trip versus just paying cash. For more information about Muni's role for the event, click here. Its really sad because one of the main reasons to get clipper is supposed to be that it takes care of all these things (transfers, etc) for you, rather than making things worse.